Christmas books! Christmas books! I love Christmas books! Anthologies are hit or miss for me – short stories can go either way. Sometimes they’re perfectly pint size stories, sometimes they’re poorly paced and only serve to frustrate me that they should have been full length novels. I’m always willing to give one a go (after all, reading 100ish pages is about an hour’s time commitment for me, maybe 2, versus 3 or 4 for a full length. Yes, I know I read fast), but when it comes to anthologies I tend to make sure there’s at least one author I trust in there to guarantee that I’ll like at least one story. With this book, there were three – Jeffries, Camp and Hawkins are favorites of mine and Duran has been on my TBR list for a while. 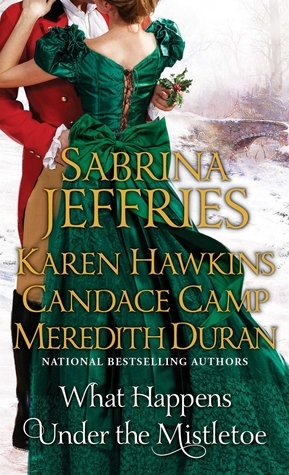 If you are a fan of Regency romances and Christmas, definitely pick up this book. Jeffries’ offering The Heiress and the Hothead is charming, Camp’s By Any Other Name is so much fun and full of her trademark sass. Hawkins’ is set in Scotland, as you would expect and is a tale of intrigue and mistaken identities. The surprise for me was Duran’s, which I loved so very much and cannot wait to read more from her. I read this whole thing in a morning, cozy-ed up in bed with a cup of a coffee. If I had a fireplace, I would have been in front of it with a glass of wine or a mug of hot coco. This would also serve as a great stocking stuffer for any romance fans on your list. I received a copy of this one from the publishers via NetGalley and am supremely thankful. Books with Children, Christmas, Coffee, Historical, Hot Chocolate, Regency, Romance, Short Story, Steaming Up Windows, U.K.